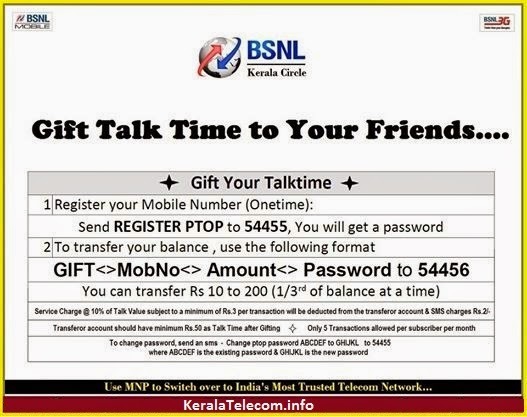 BSNL has introduced "Gift Talk Time facility" to all GSM Prepaid Mobile Customers within the same Circle. Through this, a prepaid subscriber can transfer talk time from his prepaid amount to another prepaid subscriber of BSNL within the same circle. Gifting facility is available to all BSNL Prepaid Customers in all the telecom circles in India. This facility is very much useful in emergency situations when retailer / online recharge option is not available. We can gift talk time in multiples of Rs.10/- ( from Rs 10/- to Rs.200/-). Guidelines for transfer of talk time to another BSNL GSM / 3G Prepaid subscriber is given below. This facility is popular among youngsters and is used to GIFT TALK TIME on special occasions like Birthdays, Anniversaries etc. To register, send SMS with keyword “register ptop” to toll free short code 54455. After registering, following SMS will be sent by the C-TOPUP Platform to the subscriber from short code 54455:- “Dear subscriber, registration for ptop is successful. Password is “ABCDEF”. To de-register, subscriber is required to send SMS with keyword “deregister ptop” to toll free short code 54455. For de-registration the following confirmation SMS will be sent by the home zone C-TOPUP platform to the subscriber after deregistration:-“Dear subscriber, deregistration for ptop is successful”. In case, a subscriber wishes to change the password, he / she can send SMS keyword, “Change ptop password ABCDEF to GHIJKL repeat GHIJKL” to short code 54455 (where ABCDEF is the existing password and GHIJKL is the new password). The C-TOPUP Platform will look into the content of the SMS and will check from the IN system availability of required balance talk value in the account of transferor. (a) Amount of minimum Rs. 10 or its multiples upto maximum amount of Rs.200 is allowed as talk value transfer per transaction i.e. value of talk time transfer (Rs. X) can be between Rs.10 and Rs.200 but in multiples of Rs.10 only. (b) Service charges @ 10% of talk-value to be transferred, subject to a minimum of Rs.3 per transaction, will additionally be deducted from the talk value of transferor account. Net talk value X, to be equal to that requested by the subscriber, is to be credited to the account of transferee after deducting Rs. X and 10% of Rs. X or Rs. 3, whichever is higher, from the account of transferor. (c) Gifting can be done by the subscriber maximum 5 times in a month. (d) Talk time transfer from GSM PCO will not be allowed. Dear Readers, have you enjoyed the Gift Talk Time feature of BSNL Mobile? Whether this facility is useful for ordinary people? Compare similar facilities offered by other private operators.